How can you defend play to your school administrator? Below is what we suggested…what would you add?? Today, in conjunction with the Alliance fo r Childhood, we are thrilled to release our new report Reading Instruction in Kindergarten: Little to Gain and Much to Lose. 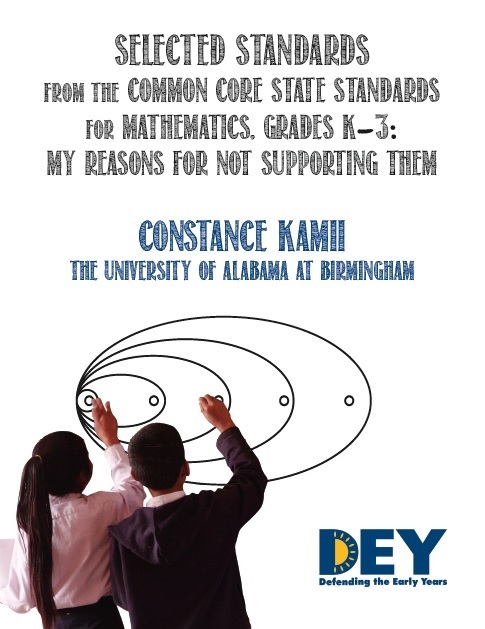 In the report we concluded that Common Core reading requirements for kindergarten are inappropriate and not well-grounded in research. 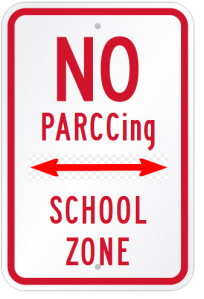 Under Common Core, students are expected to be able to read before entering first grade. Back now from Washington, DC and beginning to reflect on all that happened. Here are just a few initial thoughts — and more soon. 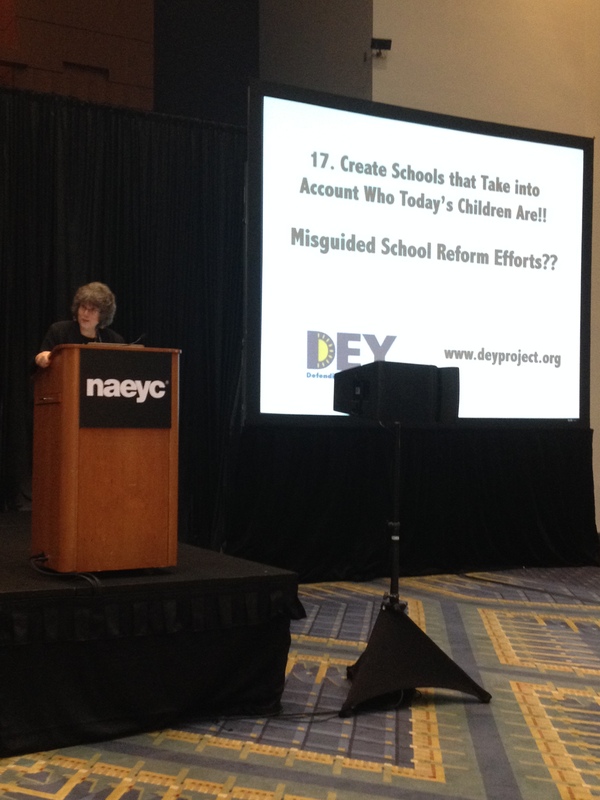 Diane lets everyone in the packed hall know about DEY’s efforts! There were some encouraging indicators. Quite exciting was the turnout for DEY Senior Adviser Diane Levin’s featured session Beyond Remote-Controlled Childhood: Teaching Young Children in the Media Age. The massive room was filled – the estimate was at least 1,000 people in attendance. Diane explained the many ways in which young children are affected by popular culture and exposure to media. She shared successful strategies for working with children and families. In her speech Diane called for creating schools that take into account who today’s children are – and to much applause she questioned current misguided school reform. Many thanks to Community Playthings for sponsoring this important session! 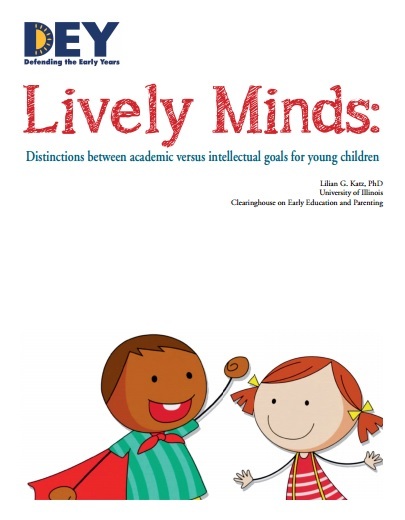 If you missed the session and want to know more, Diane’s book is available through the NAEYC online bookstore. Many thanks also to the early childhood teacher activists who joined us at our session Finding Your Voice: Becoming A Teacher Activist, and for our evening meeting at The Henley Park Hotel. You shared your stories and your ideas – and we learned as much from you as you (hopefully!) learned from us. It was encouraging to finally meet many of you in person, after having met only online until now. DEY will be working to follow up on the ideas shared, and so please stay tuned. In the opening session it was heartening to hear NAEYC’s new executive director Rhian Evans Allvin encourage attendees to go out and vote. Democrats, Republicans, Independents, Green Party…whatever your political inclination is: vote! Voting is one way for early childhood educators to use their voices. As this new bill, the Strong Start for America’s Children Act gains traction, it will be our voices that help to keep what is best for children at the center. 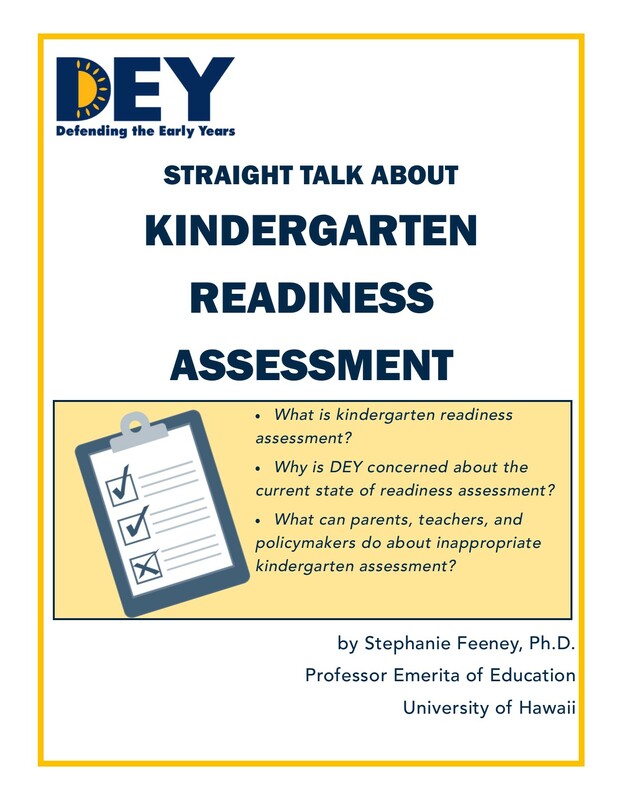 Finally, although I wasn’t able to attend the session, I heard great things about a reflection on advocacy from folks who have been working for high-quality early childhood education for decades – folks like Joan Lombardi and Marcy Whitebook. Click here to read the entire article: The Looming Fight Over Obama’s Pre-K Plan: It’s Not Just About the Money.